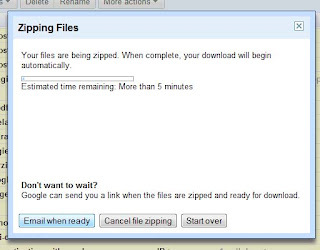 Google Docs Lets You Export Your Files In A Zip Archive ! 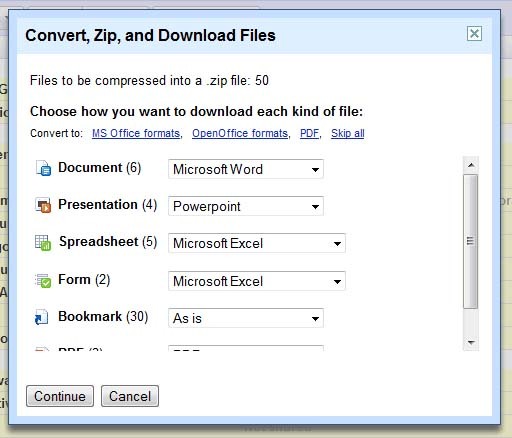 Now it is possible to export all of our documents, spreadsheets, presentations and PDFs from Google Docs in a ZIP archive. If we have to select all of files, we need to go the “All Items” section and to scroll down to the bottom of the documents list, click on the checkbox button from the toolbar and then on “Select all visible”. Although Google Docs is using “Infinite Scrolling”, yet it is not fair enough to select all of the documents from a view. Once you select all of your files, just right click and choose “Export”. 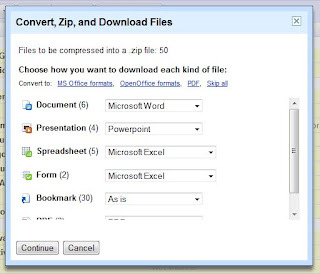 Then you will be prompted to choose a download format for each kind of file like MS Office formats, OpenOffice formats, PDF or some other formats. Thereafter, click on “Continue” and Google will start to compress all of your files and create an archive. After doing all of the above, you will receive an email when the files are zipped.